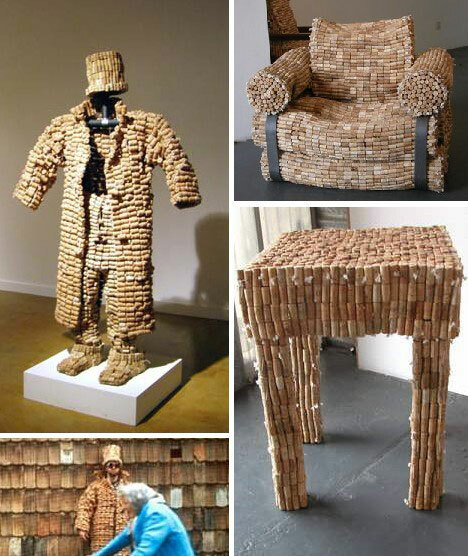 Natural, versatile, environmentally-friendly cork is mainly used for stoppers on wine and champagne bottles but its unique properties also lend a unique character to artistic endeavors. 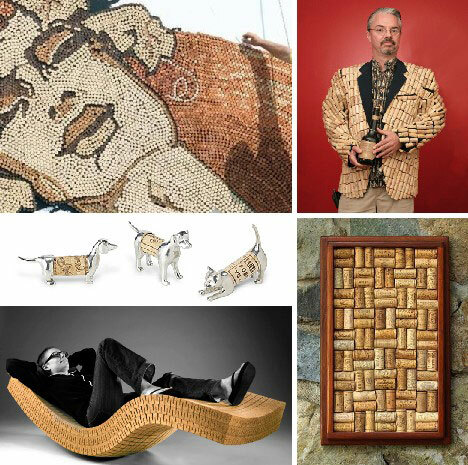 These 25 examples show how creative minds have beautified the world with cork – drinking is optional. 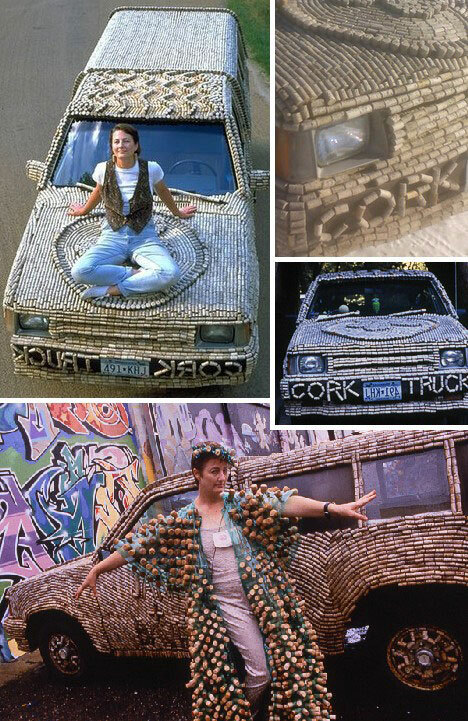 Why would you want to cover your truck in corks? Better yet, why WOULD’NT you? Cork is naturally impermeable and water resistant – there’s a reason it’s used to seal bottles, after all. As for the Cork Truck, owner Jan Elftmann didn’t actually drink 10,000 bottles of wine to get the corks which cover her truck; she saved them up while working for 13 years as a waitress at an Italian restaurant. 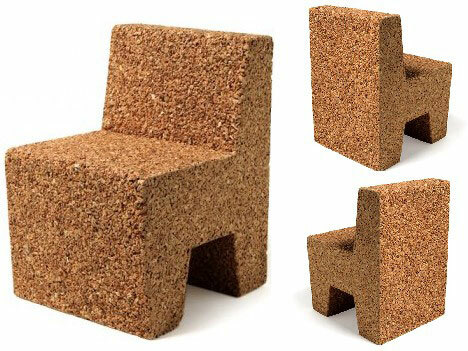 Michalik makes other things from cork and cork manufacturing by-products, such as this cast cork lightweight kids chair. 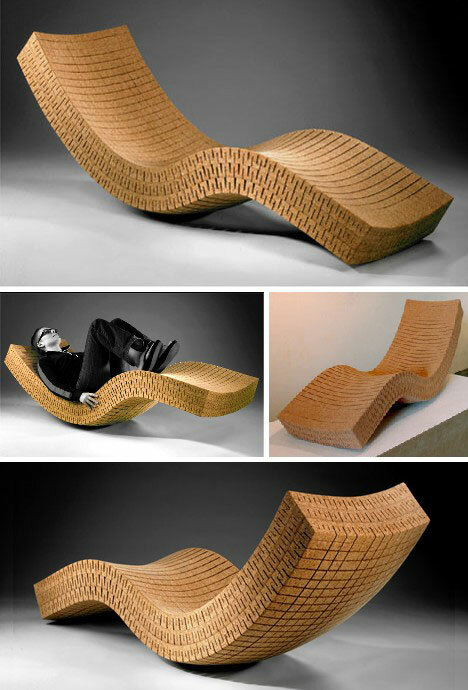 The 17-inch tall chair is composed of pure granulated cork sourced directly from bottle-stopper manufacturers and is held together using a non-toxic, eco-freindly binding agent. Kids, DO try this at home. Soften up interior spaces with Sofa Bricks. 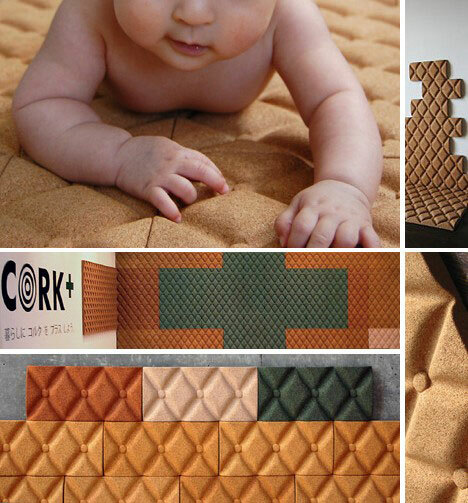 Designer Aya Koike created these handy cork bricks so home decorators could add a kinder, gentler look to their room decor. Available in a number of different shades, Sofa Bricks are flexible in more ways than one – mix & match them any way your artistic vision dictates. There’s nothing spartan about the World’s largest Cork Mosaic being assembled cork by cork on the side of a Sheraton hotel by artist Saimir Strati. 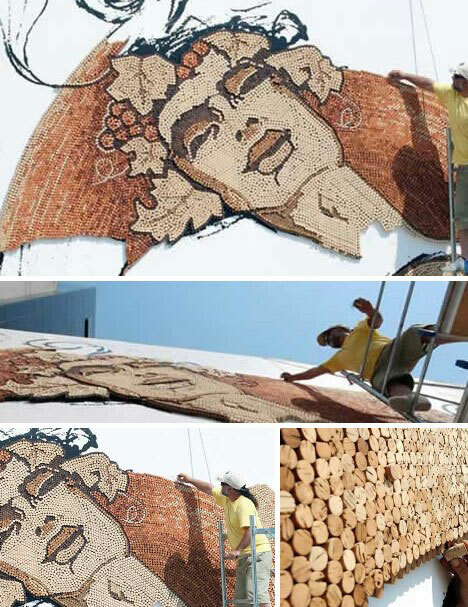 The corks – all 300,000 of them – are arranged in layers giving the piece a stunning 3D effect. Strati had no reply when asked what happened to the third of a million wine bottles… or their contents, which together would form a small wine-dark sea. Working with so many corks is no big deal for Strati… his previous projects included a portrait of Leonardo da Vinci made with half a million nails and a horse constructed from 1.5 million toothpicks. Pretty natty, Strati! 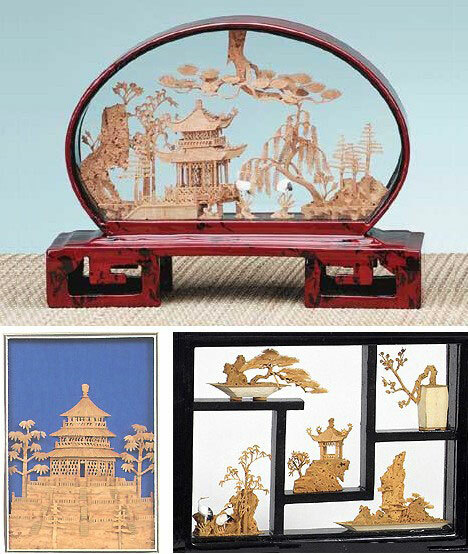 Intricately detailed scenes laboriously carved from cork by skilled craftsmen have been a fixture of Chinese art and a favorite of Western collectors for many years. Sometimes framed and set against a colored background, the delicate and fragile carvings are more often sandwiched between glass to highlight their three-dimensional character. Due to its impermeability and low density, cork has traditionally been used in flotation devices such as life jackets. 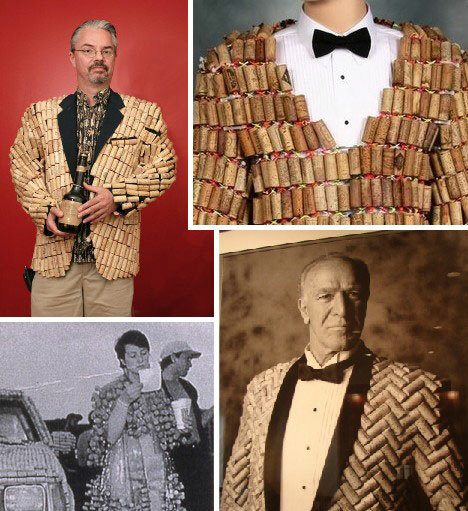 The cork jackets above break with tradition style-wise though they’re undoubtedly waterproof. We often celebrate weddings, business deals and other special occasions with a bottle of vino or something sparking. 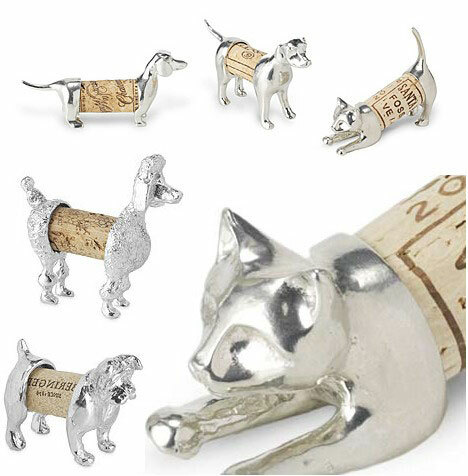 Those are the corks you WANT to save, and Cork Pets help you do just that. Lori Strickland designed these perky pets, carefully cast in pewter using the age-old lost-wax method and polished to a warm glow. Gabriel Wiese is a cabinet maker by training… wine cabinets, I’m guessing. How else to explain this fully functional suit of corks that Wiese has actually “test-driven” for Korkart in the streets of Saalfeld, Germany? Displayed at San Jose’s Natalie and James Thompson Gallery, Wiese’s cork coat is joined by a quite comfy looking cork easy chair and a snazzy end table. Above is Wiese, either resting between projects or sleeping off one heck of a bender! Cork art doesn’t get much better looking than these mahogany-framed compositions from Big Day, Big Moment. 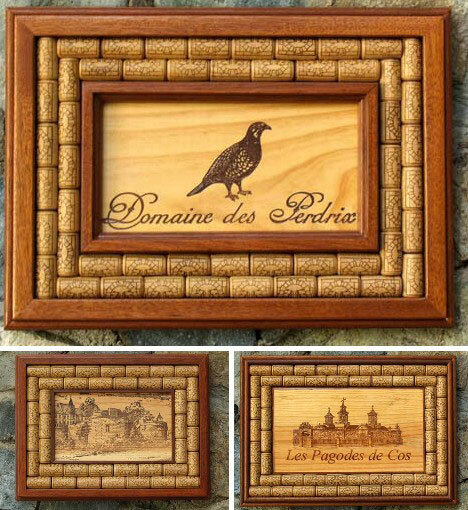 While many of the works feature attractive geometric arrangements of authentic wine corks, several combine corks with traditionally styled wine-country scenes. And above are a few of the framed geometric cork arrangements, somewhat reminiscent of the complex engraved designs featured on old banknotes. 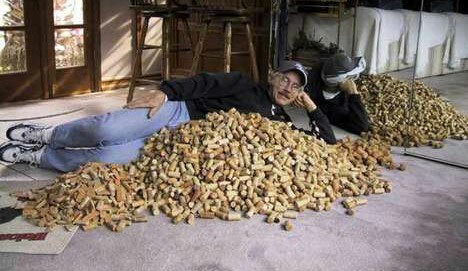 In closing, it only seems right to mention Steven Leslie’s online tribute to the artistic cork, One of a Cork. 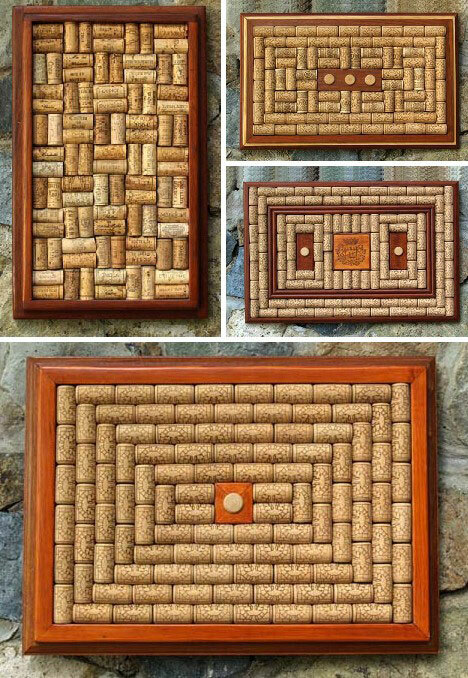 To quote Leslie’s and his sites’ mission statement, “This site is an online gallery displaying many of my latest creations within the medium of recycled wine cork. 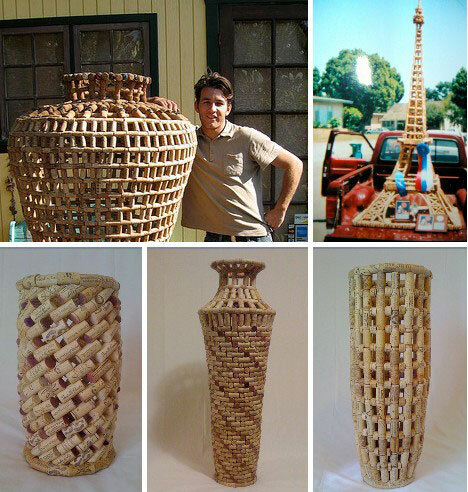 Here you will learn about the history of wine cork, how you can save the endangered specie that is wine cork and how you can own one of these spectacular acts of historical preservation.” Each one of Leslie’s cork-creations uses several hundred wine corks – except for La Courk Eiffel, which is constructed from exactly 4,425. Good on ya, Steven, you really are one of a cork!